From transACTION (Leader (pdf) | Participant (pdf)): “Most transgender Christians are searching for the same things that other believers want: a connection to their God within a loving community where worship and working for equality and justice are the focus of the Christian experience. Unfortunately, these searching transgender people are too often left without a place to call their “church home” because most congregations and religious institutions are not ready to welcome them as their Christian companions. By Reverend Erin K. Swenson, Th.M., Ph.D.
Rev. Erin Swenson broke new ground within mainstream Christian Protestant faith groups on October 22, 1996, when the Presbytery of Greater Atlanta, by a vote of 186 to 161, sustained her ordination as a Presbyterian minister. Erin had transitioned from male to female in 1995/96 after 23 years of ordained service, and with the Presbytery’s vote in 1996 she became the first mainstream minister to make a gender transition while remaining in ordained office. Center for Gender Sanity assists with all aspects of transition in the workplace. Made in God’s Image: A Resource for Dialogue about Gender Diversity by Ann Thompson Cook answers basic questions about gender variance as well as transgender and intersex people and their experiences. 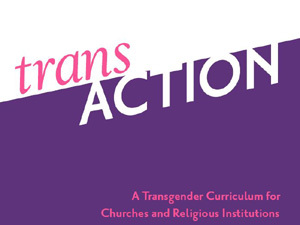 Pastoral Care in Transgender Experience (pdf) is a resource from the Reverend Erin K. Swenson, Th.M., Ph.D.
Transrespect Verses Transphobia Worldwide Research Project is a comparative, ongoing qualitative-quantitative research project conducted by Transgender Europe.